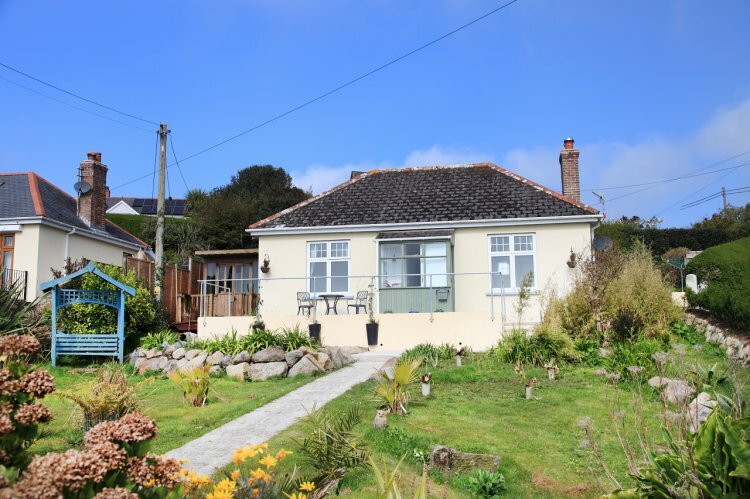 Carnsullan is a wonderfully positioned bungalow, with hillside views over the sea and harbour, and a short walk to the beach and village centre. The all on one level accommodation is perfect for up to four guests with year round comfort thanks to the central heating, wood burner and in the winter the Rayburn can also be used (October to Easter). Coming Soon: please check back for availability or contact us to enquire. From your private parking area, space for 2 cars, you enter into the spacious and sun-soaked front garden. An entrance hall, perfect for walking boots, leads in to the living room where there’s comfortable seating around the wood burner and the TV, with DVD player. The compact kitchen offers a bright space to prepare your lunches or cook dinner if you need a night away from the excellent eateries on the Lizard. Equipped with a 4-ring hob, table top oven, microwave, fridge with freezer compartment, kettle and toaster. The dining room has a table and four chairs and features the Rayburn which can also be used for cooking in the winter (October to Easter). The master bedroom is at the front of the bungalow which has wonderful sea views, even from the 5’ king-size bed, and for storage there’s a wardrobe, chest of drawers and bedside tables with lamps. Bedroom two is a double room with 4’6” bed, low wardrobe with drawer space, beside tables with lamps and has a garden view. Bedroom three is a single room with 2’6 single bed most suitable for children and is offered to allow flexibility for small families. Family bathroom with shower over bath, toilet, handbasin and heated towel rail. Outside, the garden has a lovely lawn and summer-house where you can sit and watch the waves go by and lots of interesting shipping can often be seen going back and forth too. There is an unfenced pond in the garden so please take care near this. Rental includes bedlinen, towels, WiFi, central heating and seasonal Rayburn use. 1 dog is welcome by prior arrangement of £25 per week. Please also note, although there are enough beds to sleep 5, the property accommodates 4 persons only and the additional bed is just to offer more flexible sleeping arrangements.